(Hinduism has a rich and sacred history dating back thousands of years. The values and teachings of our ancient scriptures are timeless and have a universal relevance. Dr M Lakshmi Kumari, former President of the Vivekananda Kendra, shows us how Sri Sarada Devi made these ancient precepts relevant for the modern man.) All of us are in a way bridges. Every father and mother, every human being is a bridge that spans two generations. Each generation has to hand over the keys to the next generation by which they can unlock their inner potentialities and possibilities. But what sort of keys do we hand over to our children? These days we have only one key, by which our material possibilities can be unlocked, made more productive and pleasurable, though not satisfactory. Within a short time that key starts rusting. With it we cannot open our homes, least of all our hearts. We seem to have lost the key by which we can unlock ourselves and through us the entire universe. This has been happening from time immemorial and hence Sri Krishna declares, 'I take birth again and again when dharma declines and adharma gains supremacy.' When men forget their duty of handing over the key of satya and dharma, asuric forces take over and the whole society slips into decay. Avatars come to remove the rust from our keys and to hand over the right keys to us by which human welfare can be restored. What keys did Mother give us? What bridge did she construct for us so that our lives get a new meaning and become fulfilled? Every bridge spans either the two banks of a river or the chasm between two peaks. With reference to human life, a bridge takes us from one set of values to another. Holy Mother's was such a beautiful bridge by which anybody could cross over the mighty ocean of samsara. Rarely do people of her calibre appear who can construct such a wonderful bridge. 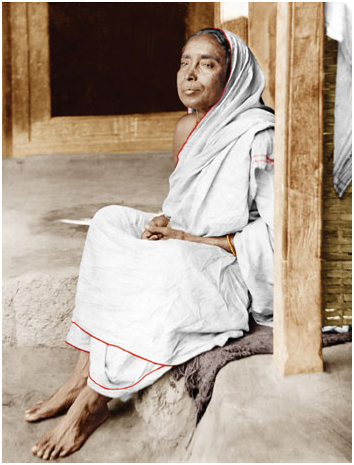 Sarada Devi was, like many of us, born and brought up in a rural household, exposed to much penury and hardship. But the rays of light of good breeding were part and parcel of her upbringing and she grew up as an extraordinarily sensitive and kind-hearted daughter. All the wonderful human qualities that mark a super-human being manifested in her effortlessly. Today we seem to have lost the fragrance of these natural character-building traits. Neither our parents nor teachers have the time or the capacity to inculcate these qualities, the hallmark of a good human being, in us. Here is something for us to contemplate - what have we lost? Equipped though Holy Mother was from childhood with the best of materials to build the bridge of human understanding, yet there was one lacuna and that needed to be filled up. The strength of the human bridge lies in God consciousness, the realization of the Truth of the atman within and without. The Light hidden within had to be brought out. From a little known village girl she had to be transformed into the Divine Mother, to play her full part as an avatar with her husband. She had to become the Mother of the rich and poor, fallen and downtrodden, sannyasis and dacoits! For this she had to become one with the Light of knowledge, love and action. She went to Sri Ramakrishna at Dakshineshwar. She was his shakti, first as his dutiful wife, then as his dedicated disciple and to manifest divine motherhood. Every word and action of hers bore the imprint of divinity. On her bridge, one is led from untruth to Truth, from darkness to light, from death to immortality. In the arati song of Sri Ramakrishna there is a line 'jnananjanavimalanayanavikshanemohajaya,' - the purity of Sri Ramakrishna's eyes adorned with the collyrium of knowledge dispels delusion. What was there in Mother's eyes which could transform human beings in toto? What collyrium did she use to remove the delusion in others? lt was premanjana, the collyrium of love. That was the bridge through which she drew the dacoit into her heart. Because of that premanjana in her eyes she saw everyone as her own. This is what mothers of today need to learn. Holy Mother's biographers extol her life of absolute purity. There was not one black spot on her. Her purity was centred on the realization of Truth with its byproducts of samabhavana and samadarsitva, same-sightedness and universal love. Mother never asked for anybody's credit card of worthiness before she consoled and enriched them with her love. Those who came to rob her were themselves robbed, of their inner impurities. Let us imbibe this lesson of true love from her. This divine vision was Sri Ramakrishna's gift to Sarada Devi when he made her part of his very being through the Shodashi Puja which marked the culmination of his sadhana. Thus Mother received the whole of his spiritual effulgence. She was the fittest recipient of this unusual legacy, because she was none other than Prakriti (Primordial Power), Parama (Supreme), Abhaya and Varada (She who grants fearlessness and fulfils desires). She was the Bhavatarini whom Sri Ramakrishna worshipped in the temple. Otherwise how could she give, in such a simple homely way, truths which rishis had realized after long and severe austerities? Even Sri Ramakrishna had to climb so many difficult steps before he could enter the sanctum sanctorum of the Divine Mother's heart. She was a perfect being without any selfishness or self-interest or self-glorification of any kind, so her thoughts, words and actions did not cast any shadow anywhere. There was only benediction in front and blessing behind each and every movement of hers. Is it not a great lesson to those who are unhappy and dissatisfied in life? The eternal bridge that Holy Mother made connected the ancient and the modern. How can someone who lives in the present make use of the ancient? One has to clearly understand the nature of this bridge which spans time and space with values, never dying and ever valid. Holy Mother acquired these values through extraordinary self-denial and service to Sri Ramakrishna. It was her genius that she could make it applicable for all times to come. No wonder that we find all the epithets of the great Mother of the Universe in her. 'Satyam sivamsundaram' - these are the ancient facets of eternal Truth that we find on the wonderful modern bridge that Holy Mother has given to us. Truth alone makes human life valuable. 'Nanyahpanthavidyateayanaya,' there is no other way, as our rishis repeat again and again. Satyam, truth alone was dear to Mother and she learned early in life to centre her being in it. This Truth made her see everything as her own, soaked in the divinity that she herself experienced abundantly and at all times. Modern science tries to express Oneness as interrelated, interconnected, interdependent and so on. But can it express it as aptly as 'vasudaivakutumbakam,' the universe is one family, especially when demonstrated by an all-knowing Mother like her? The second span is sivam - auspiciousness. Mother was the image of auspiciousness and today even her pictures radiate the same. Everything she said or touched was auspicious. All of us should keep a photo of Holy Mother somewhere in our homes to make them auspicious. Satyam is also sundaram, Truth is beauty; Mother was beautiful. Her life exemplifies Vedantic truths that adorn human life with a rare beauty. Holy Mother never extended her hand to anybody for anything. The only thing she ever wanted was that Sri Ramakrishna fill her heart and mind with premasudha rasa, the nectar of divine love. Sitting in the nahabat, a small room at Dakshineshwar, she became the Divine Mother and embraced humanity through her love and understanding. She shows us how to expand and be really global by assimilating truth, goodness and beauty in everyone. We should walk on this eternal bridge which spans the ancient and the modern. Modern science has come full circle and now reverts to the concepts of voluntary simplicity, frugal consumption and so on, based on its new understanding of the interconnection of the whole universe. The Upanishadic dictum, 'tenatyaktenabhunjita,' enjoy by renouncing, provides the spiritual foundation. India has preserved these values from time immemorial. Our ancient values based on satyam and dharma can even today provide all that is necessary to make human life worthwhile. Fortunately for us our avatars continue to provide bridges making use of the ancient values so that even today we can cross the ocean of samsara. Let us pray to Holy Mother to give us courage and strength of conviction to use the wonderful bridge that she has built for us.